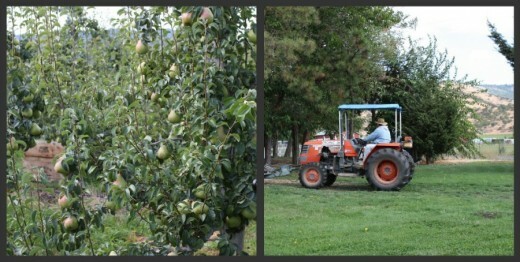 Ooooh, I adore Harry & David’s pears…so delicious! We would often get a box of their produce at Christmas from my aunt and uncle. One holiday gift I always looked forward to was the PJ’s my mom would wrap up for me and my sister every year…we got to open them on Christmas eve and wear them to bed! I enjoy the time I get every year to spend time with loved ones. That is the part of the holiday I always remember. My mom used to order from Harry & David every year for our out of town relatives. It’s a great company, with beautiful products! I always look forward to my annual holiday cookie exchange! It always gets me in the holiday spirit, and all the stories of the cookie recipes are so great to hear!! I swear I’m not just saying this because of this post, but every once and a while my parents will send us a Harry and David gift box, and I’m always drooling over the pears while my boyfriend claims the Moose Munch as his own. I love that my parents do it randomly – not necessarily for any given holiday, but sometimes – so it’s always a surprise… and it never lasts long in our house! At the risk of seeming incredibly corny, I’m most excited for the first Christmas as a newly married couple in our brand new home. Simple pleasures for me. omg. Harry & David pears are the best! Glad you are bouncing back from your accident. Our favourite holiday treat was the annual box of Chocolate Charlie from Claeys Candy in South Bend, Indiana. My in-laws sent it like clockwork. Now that they are gone, we have taken on that family tradition, even though we live in Seattle, not South Bend. Because some traditions are too important to not pass on. What a fantastic trip! The gift I still look forward to receiving every year: a box of my mom’s homemade Christmas cookies, particulary her black pepper cookies. My family does not do much for holidays, in fact nothing at all! So, I am trying to make new traditions for my two kids and I, which is being re-vamped after an awful divorce! Really loving doing all the things I never did as a kid-decorating easter eggs, putting up the Christmas Tree, and having a great Halloween with friends. I look forward to getting my mom’s gingerbread every year. Lucky you, I love their catalog. For the holidays I am looking forward to receive cards from my children. That makes me happy. Sounds like a lovely trip! I always look forward to receiving a stocking from my mom–lots of random goodies and always a tangerine in the toe! For years, I asked my mom and sister to get me some Harry & David pears and they did not disappoint! My husband is from Weed, CA so Medford isn’t too far off at all, yet we’ve still never made it there to visit their facility. We always, always fill each other’s stockings with fun, small, wrapped things (toothpaste, socks, silly gifts) and we always find someone to give a totally off-the-wall funny present to – like the time we gave my sister a turquoise, bejewled and mariboued decorative(?!) reindeer… (we always keep it small). Glad to hear such positive things about Harry and David. I will be having our first baby in a few weeks and will be looking for some easy gift-giving ideas. I look forward to receiving an ornament for my tree from my nephew, as well as my stocking from my Dad. Thanks for the give-away opportunity, Dana, and I hope you’re feeling better. I look forward to getting together and celebrating Christmas. Dana – hope you and Graham are doing well! What a fun trip! I love it when you find a really good-hearted company that sells quality products…they’re so few and far between. I’m not so big on pears (weird textural issues) so I’ll abstain from the giveaway but honestly my favorite part of the holidays is sharing good quality food with my family! Kinda corny but I always just look forward to seeing family and making memories. Stuff can never compare but if I had to name a gift I look forward to, it’s gotta be the food. Big dinners and yummy sweets! Anything w/ pumpkin! Stocking stuffers were always the highlight of the gift exchange at Christmas! Candy, deodorant, toothbrushes, gum, and usually at least one thing that was pretty ridiculous! I always looked forward to getting a big box of English Muffins from my inlaws every holiday season! The pears are what I look forward to having each Christmas. It wouldn’t be the holidays without them! Hi Dana – Every year for more than 30 years, a long ago, grateful client has sent something to us to say thank you to my husband. Lately it’s been a fresh wreath which feels like the opening salvo in the holidays, and I always look forward to it. After your post and trip, I am inspired to re-remember Harry and David pears (in Alaska in December those were a huge treat!). I am glad you are better! I always look forward to having a tree and decorating it – one Christmas, while stationed in Germany, I actually ended up decorating a large plant that was in our apartment (it was nice, but just not the same as having a Christmas tree and that wonderful Christmas tree smell wafting throughout the apartment)! YUM, pears!! I always look forward to watching niece and nephew open presents. And making sugar cookies with my mom. How wonderful! I might just have to add Harry and David to my Xmas list for friends and family this year. For Xmas, I look forward to being finished with my son’s surgery and moving toward “normalcy”. Thanks Dana as ever for your great blog! I always looked forward to having Christmas Eve dinner with our best friends before going to church. We didn’t get great gifts, but the whole experience remains one of my most fond memories. I can’t participate in the giveaway but as a kid I loved advent calendars and the anticipation of opening a door everyday in the lead up to christmas (and the chocolate too). Our boy has 2 calendars now – a chocolate/treat one (I’m hoping it will be a homemade one if I can finish it in time this year) and a quilt/ornament one. And I miss getting mum’s fruitcake so I just have to make my own now. I loved this post – looks like such a lovely place to visit. Each year Santa would fill our stockings with different little treats, but most memorably, there was always a fresh orange and a bag of pistachios. Now that I have my own family, I believe oranges and pistachios will always be stuffed at the bottom of each stocking. I love Harry and David anything!! MMM pears! The gift that I always always look forward to is my own special box of SEE”s Candies, dark nuts and chews!! My kids are getting old enough to make gifts in school/daycare and man, I LOVE those so much! Every year, my uncle brings us oranges from his grove and cuts them up in our kitchen. It’s an art form – he cuts the entire peel in one long piece and then squeezes the juice from the core over the oranges in the bowl. I look forward to it every year! my mom stopped giving me clothes when i was a freshman in high school b/c she clearly wasn’t ‘getting’ my style ;) that’s when the gift cards to nordstrom started. i get them once a year and always look forward to it! I always look forward to getting a Verbena scented Archipelago candle from my mom. Best candle ever! The stocking from my mom is always my favorite, but I love anything homemade. 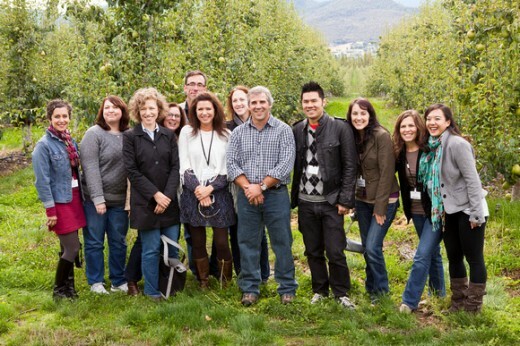 I had no idea Harry and David was in Medford, yay for another great NW company! The Christmas gift I look forward to the most every year is the stocking that my daughter fills for me. It is always an effort of love – what better way to celebrate the gift of a Savior! The christmas gift I am most looking forward to isn’t really a “gift” …it’s having my kids come home…having our family all together tops any material gift I could ever get!! I was always able to look forward to a ripe clementine in the bottom of my stocking. =) A silly but fun family tradition. 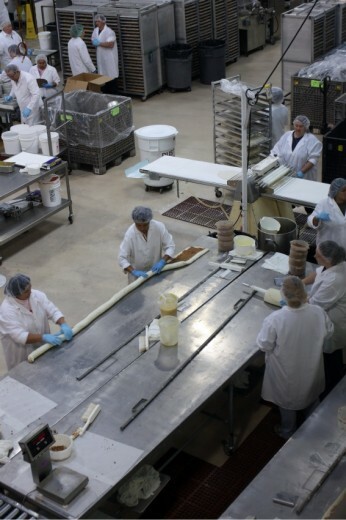 I finally figured out which photo had the six foot long cinnamon roll getting rolled up. WOW!! When I was a kid, my sister and I would get Danskin tops during Chanukah. I really liked the fun shades of these stretchy tops. I love the Rogue Valley. I used to love getting a plain old box of chocolates from my grandparents. 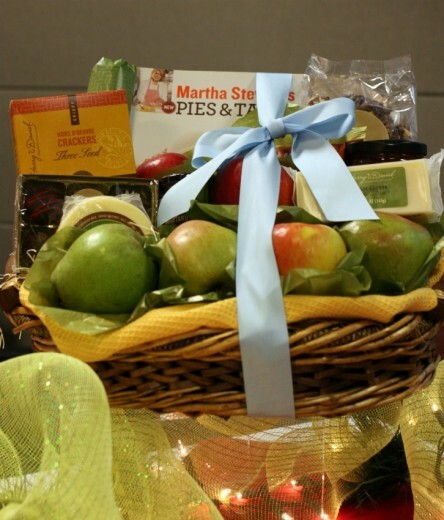 The Whitman’s sampler.great giveaway! I love Harry and David and the concept of their company. The same is true of King Arthur Flour. My aunt used to send everyone a Harry and David fruitcake every year while she was living. It’s was the only fruitcake I will eat. Now living in the desert I love gifts of fruit. Your trip sounds awesome! I’m looking forward to all the holiday sweets! My mother in law is very set in traditions, and so every year she gets me a box of mixed Jelly Bellys because when I was first dating my husband 18 yrs ago, I told her that Jelly Bellys were my favorite candy. I’ve received some Harry & David gifts in the past and they’re absolutely irresistible! But for me, the most exciting gift is one wrapped in that distinctive Williams-Sonoma paper. If it’s wrapped like that, I know that whatever is inside has to be good! The gift I love the most is the one I give to my kids. They love to open the little gifts in the stockings; cute little interesting things they would never think to ask for, and didn’t know they loved until they saw them. Those are the most fun! My sister, mother and I all look forward to the stockings the most. No matter how great our gifts are each year, the stocking is our FAVORITE part of Christmas morning – we sit around the dining room table while we go through our loot, and just enjoy each other. So glad you were able to make this trip – I’ve heard how beautiful Medford is, but your pictures prove it. The thing I look forward to getting every holiday season is the handmade candy canes from a local shop that’s more than 75 years old . . . but pears would be a close second! my husband’s extended family sends homemade caramels, perfectly wrapped every year. Look forward to them every time! The best gift of the holiday season are all the wishes I get from my friends from all corners of the world. It’s wonderful to remember all the people who have touched your life. Growing up, I always loved the toys I got from santa in my stocking. The anticipation on christmas morning was like nothing else! Each year I look forward to a package of Peppermint Bark candy from my in-laws. Mmmmmmm! My favorite holiday gift is a box of clementines that we get from a family friend. 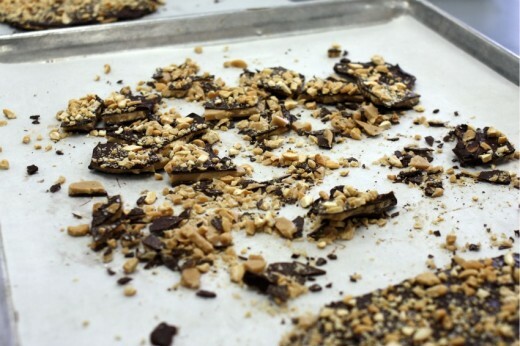 It’s the perfect snack to eat amongst all of the treats and sweets that are over consumed during the holidays! I look forward to cooking with my dad. We make homemade gingersnaps & snickerdoodles, banana bread and all kinds of delicious food. Food & family is what I look forward to the most. I look forward to the homemade Chex mix my brother makes every year. It’s spicy and so much better than anything you can buy in stores! I look forward to getting new pajamas from my dad every christmas! Coincidentally, I look forward to the gift our financial planner sends us each year – one of the Harry & David stacks (complete with Moose Munch)! We have an outlet store fairly close to us, but I’ve not visited yet … a mistake that will be rectified soon after reading your post! 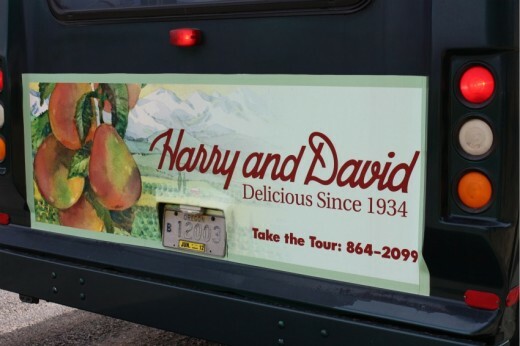 Yumm….Harry and Davids….they have the best everything but their pears are the best. Spending time with my boys is the best holiday gift. From their first christmas on. Dana- it was so nice reading your recap of Harry & David. It’s definitely one of those companies I was skeptical of before hand! It’s refreshing to know their products reflect true quality. Hmmm let’s see, what gift am I hoping for this year? Honestly I’m more exciting about a gift I’m giving- a surprise warm weather get away for my mom! I know she could really use it, and I can’t to see her face Christmas morning. Hello from Eastlake! My Aunt Betty always sent a big Lebanon (PA) bologna each Xmas. Imagine the love child of salami and bologna and that describes the flavor and consistency. Nice to know about Harry and David. When I was little my father always made us hunt for our Christmas gifts. He would spend weeks writing clues, often in poetry form and one of us would have to hunt for our girt. It was always so fun if we were the ones to hunt that year. Later when I had my three boys, Grandpa always did a hunt for them. So glad you are safe and okay after your car accident. Those reminders to slow down in life are scary but sadly necessary sometimes. I love getting fancy popcorn. We have clients that send it to our office every year. I wish we’d get Harry & David fruit! I have to say, one of Ken’s college friends sends us a box of Harry and David pears every year, and I look forward to it. Those are some GOOD pears. For over 20 years it’s been Fran’s chocolates in the stockings. When my sister and I were in college or abroad my mom still made sure we got something delicious from there. Now I get to watch my daughter go through the same goodies from Grandma with all kinds of excitement. I also love marzipan fruits, veggies, and pigs (especially the pigs), although they are sometimes more fun to see than eat. 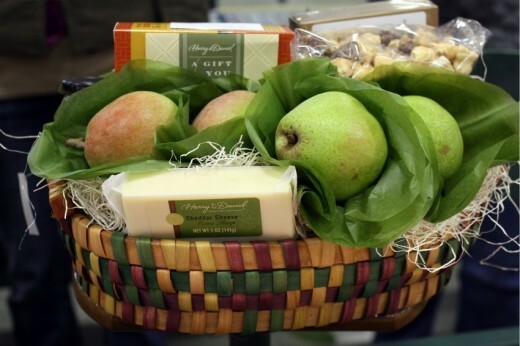 One of my most favorite wedding presents was a year of fruit from Harry and David and the pears were incredible! This is so good to hear! My uncle often sends us a Harry and David basket and it’s always delicious. 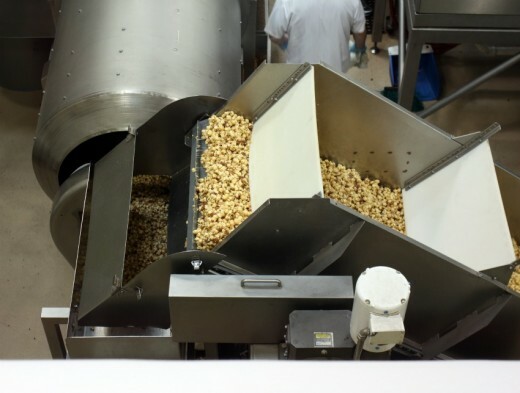 It’s good to hear that the company lives up to its food! I feel like I should think of a food gift, but honestly what I look forward to every year is getting a new board game for my family to play during the holiday. We open it early, like Christmas Eve Day so that we can all play together while everyone is in town. It’s a nice tradition. In California, I look forward to the boxes of See’s Candies that inevitably get passed around. My work gives big boxes to clients and we always end up with a few leftover and my relatives are always gifting (and regifting) the nuts and chews. My all-time favorites are the Scotchmallows – dark chocolate, marshmallow and caramel. How can you go wrong? They’re also VERY easy to identify in a variety pack, which is a huge plus. My grandma always made a bunch of cookies for our family each Christmas. She’d give us a huge tin with at least 5 layers of cookies. I always loved cracking into that tin to see what she made that year. Each yeas was different. Loved that. I look forward to receiving handmade, heartfelt gifts! Handmade cards from children on teachers’ day! Love Henry and David pears! My favorite gift is from my mother. Each year, she gets me some antique glassware or figurine. For my 25th Birthday I actually asked for Harry & David pears–so delish! During the holiday season I look forward to the gifts of food–specifically my Mom’s meringue kisses, homemade coffee cake (to be consumed Christmas morning), and my neighbor’s (aka second-mom) three-layer mint brownies. YUM! A couple years ago my daughter sent me Harry & David’s Chicken Pie. I now look forward to receiving and eating it each year. I used to live in Medford! And still have family there. Love Harry & David’s and would love their pears. I look forward to receiving a gift from my sister (in Medford) every year. She is always so thoughtful and crams a stocking full of fun stuff every year. Glad you enjoyed the Rogue Valley! Dana, I hope you and Graham are doing better. I love Harry and David pears, the only kind we buy. We go through about 10 boxes in the winter. I now love to receive anything Eloise, Owen or Wyatt my grandkids make for the holiday and pictures of my wonderful family. Take care. A great sweater or cookbook. My grandmother was a fudge maker extraordinaire from the deep south – when she passed away, we buried her with her beloved fudge pot and handed out little squares of fudge at her funeral. She would always send us Georgia pecans (she had cracked and cleaned) around Christmas and my mother combined those extra special pecans with Grandmother’s fudge and caramels to make homemade turtles. My mom has perfected her turtle production and every year it is a blessing and a joy to get a tin of those turtles. My grandparents picked out a book for me every year of my life until I got married. That was always the gift I looked forward to the most. What a fun trip! My dad always gives us one sentimental gift every year. It is usually something passed down from the family-it is always my favorite! Slippers! and cookies that I’ll bake/give myself. For the past 3 years, i’ve had to celebrate the holidays in feb/march, I’m looking forward to a december one this year! I don’t know if there is a gift I look forward to but I definitely look forward to a cookie baking marathon every December. And I had no clue Harry & David kept things so local. I actually look forward to something from Harry and David every year. Either my brother or sister sends me a tower of treats or a box of pears. I never really enjoyed pears that much until I had one from Harry and David! I look forward to pleasant surprises! The Harry and David pears are the best. I’ll probably put those on the Christmas list this year. Won’t be a surprise, but still very pleasant! When we pick out our Christmas tree, I always get to pick out a custom potted arrangement for our front porch- every time I come home from work and see a little snow dust on those spruce tips and smell the fire my hubby started inside (hopefully in the fireplace, and not the kitchen! )- just makes me smile all winter long! I look forward to spending time with family. Watching my toddler open his gifts is the best part. Well, when I was a kid I appreciated any candy I got in my stocking! Candy was not as abundant in people’s homes as it is now! The end of the year, for most of my life, was associated with Summer, sun, the beach. Brazil is just gearing up for the warmest weeks of the year at that time. I look forward to sitting by the fire drinking cider with my loved ones- That’s a great gift in my book! My grandmother used to give each of us 3 kids our very own can of black olives. And no one could tell us not to eat the whole thing! Harry & David pears are the best!